There are so many ways to show and predict the real estate market in Lakeland. You can look at month-over-month numbers and year-over-year, and compare it to zip codes, single family homes, condominiums, manufactured homes and square-foot costs to closed sales, you can manipulate it in every way possible to make the stats say just about anything you want them to say. You can say sales prices are going up because homes sold for more this month than they did the same month last year, but that doesn’t take into account the fact that we have fewer homes for sale. The number of sold homes have increased when compared to the previous month and previous year. Overall existing home prices saw a decreases in average sales and median prices from the previous month. 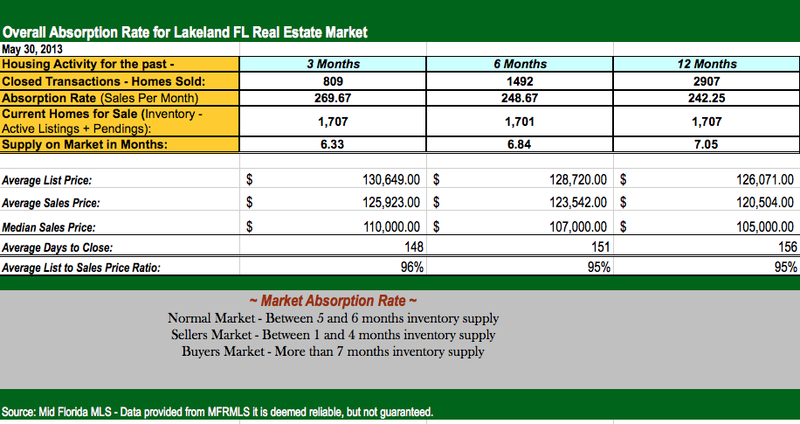 However, continued increases from the previous years suggest the housing market in Lakeland FL is back. The current overall housing inventory of actively Lakeland Fl homes for sale continues to decline and stands at 871 (05/30/2013). These are listings currently active and active w/contract. Pending homes in Lakeland currently are at 837 Lakeland properties. What I bring to you today is the overall existing housing market in Lakeland Florida. This will give you a general idea of what to expect when selling or buying a home in terms of how many homes are for sale, how many are under contract and what has actually sold. The graph below represents average and median home prices in Lakeland for various categories. When our media provides us with a real estate market reports, generally these reports outline only Single Family Homes and Condominiums. Lakeland Florida has a variety of homes, such as manufactured homes, town-homes, villas and duplex units. Average and median home prices in Lakeland for various categories. For the month of April, Lakeland’s real estate market of distressed homes had a market share of 45%. There were a total of 136 homes sold in April, according to Mid-Florida Regional MLS. There were 73 bank-owned/REO sold and 63 Lakeland FL short sales sold. If you are interested in a specific area or neighborhood in Lakeland Florida or the surrounding cities such as Bartow, Winter Haven, Auburndale, Mulberry or Plant City, feel free to contact me at 863-619-6918; email petra[at]petranorris.com or click the search button below.